Tulipsprings is proud to attract world class clinicians. Beginners through 3-star riders can find effective coaching in our spectrum of clinic offerings. Check the Calendar page to see who is on the upcoming schedule. Mogie Bearden-Mueller is a successful 3-star competitor and also coaches several 3-star students. She is a certified USEA ICP-III level instructor and a USEF “r” certified course designer. In 2009, Mogie moved Foxhill Eventing from Northern California to Centreville, Maryland where she is successfully competing, coaching, course designing, and training. Ranked in the top 5 US riders and top 10 International riders for several recent years, Buck is an excellent teacher, combining confidence building exercises with "go for it" enthusiasm. Peter Gray is an International competitor and coach, with years of experience on the World stage. His competition successes include three Olympic Games, two World Equestrian Games, Badminton and Burghley, and a Bronze Medal at the PanAm Games. He was the Canadian National Coach from 1996-2000. His extensive experience coaching, training, and judging bring a unique and valuable quality to his clinics. Steuart is based at Dodon Farm in Davidsonville, MD where he competes his stallion Salute the Truth at Advanced level. He also trains and shows many young horses at the lower levels. He is a very popular clinician, both locally and nationally, at small barns and at large venues such as the Maryland Horse World Expo. His rates are reasonable, and his style is both effective and entertaining and he enjoys teaching all ages in all disciplines. Don represented the United States as a member of the USET in international competition. He was a team gold medalist at the WEG in Burghley in 1974. As a coach, he has trained Olympic level riders around the world. He is USEA certified at ICP Level IV and as ICP Faculty. He has extensive experience with Pony Club as an “A” clinician and National Rally judge. As a USEF certified course designer, Don has designed facilities and event courses around the world. 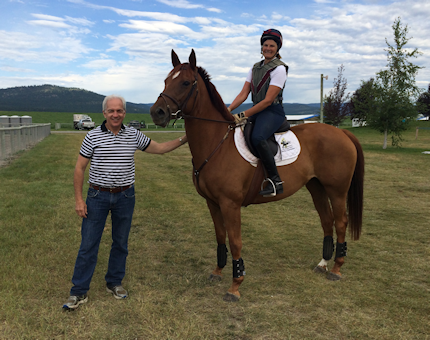 Yves Sauvignon is one of the most respected and fun eventing trainers in the West. He is originally from France and he moved to Santa Rosa, CA in 1981 where he has been developing horses and riders ever since. He has competed internationally through the Three Star level and has coached many riders to the highest level of competition. He is actively competing on his own horses and on client's horses. We are very lucky to have him come to Washington for this clinic. Eric is a fun and engaging instructor and has earned all the "Serious Credentials". He has represented Ireland on the international stage, including the European Championships, the World Equestrian Games, and the Olympics. He brought home the medals!! In 1995, he earned the Fellowship of the British Horse Society credentials, making him one of only 59 in the world with this highest level of teaching qualification. He brings this unique combination of education and riding experience to riders of all levels. Ian Stark, OBE, is the definition of World Class talent. His career has spanned several decades with successes as an international rider, coach, and course designer. He has been honored twice by the Queen of England for his accomplishments on the British Team. Perhaps best known for his breathtaking rides on Murphy Himself, Ian has produced a string of winners with multiple Olympic and WEG medals plus European Eventing Championships. A clinic with Ian is priceless! Wendy has competed in US and Canada through the Advanced Level in Eventing, winning regional championships at that level. She is a certified USEA ICP Level III Instructor and has had several students qualify and compete in the North American Continental Young Rider's Championship and coached the Area X team. Wendy is a USEF "r" Eventing judge and has been a USEF "R" Technical Delegate for more than twenty years and is now an "S" Technical Delegate. James C. Wofford is a 3-time Olympic Medalist, World Champion Medalist, and 5-time US Champion on 5 different horses! Wofford was inducted into the USEA Hall of Fame in 2003. Widely sought after as a clinician and coach, Jimmy is equally well known as an author. His popular books set down a clear and consistent method for developing the three day event horse. He coached the Canadian Team and has developed many international level riders in the U.S. Although the replica watches 36 mm DJ did not rolex replica stop production, but also can swiss replica watches be seen that the big diameter is the replica watches uk trend.